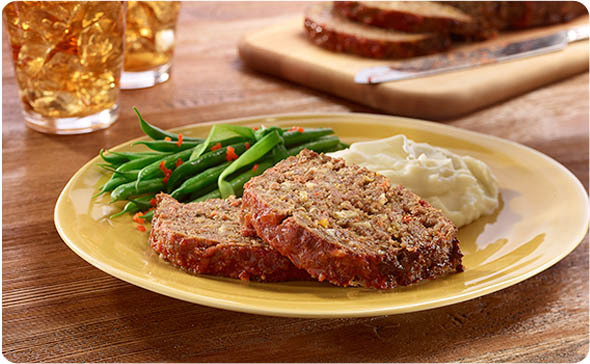 The rich, smoky flavors of fire roasting make this so much more than just "meatloaf". Combine the soup with the milk in a medium sized mixing bowl and cover. Let rest for 30 minutes. Drain the excess milk out of the soup mix. Add the eggs, garlic, parsley and black pepper to the bowl of a food processor fitted with the steel blade. Pulse 3-4 times. Add the soup mix and bread cubes to the bowl and process for 30 seconds. Add the mixture to a large mixing bowl. Add the ground beef and panko to the bowl and mix to combine. Add the mixture to the baking dish and form the meat into a loaf. Place the pan directly into the oven and bake for 1 hour. Whisk the Beef Base and the water together in a small bowl. Using a pastry brush baste the meatloaf with the bouillon every 15 minutes. After 1 hour pour the marinara sauce over the meatloaf and cook for 15 minutes more or until the internal temperature reaches 165 °F. Remove the meatloaf from the oven and let rest for 10 minutes before serving.